In his Critique of Dialectical Reason, Jean-Paul Sartre describes a queue forming early one morning at a bus stop on the Place Saint-Germain in Paris. He argues that those lining up at the stop ‘achieve practical and theoretical participation in common being’ because they have a shared interest, as people who regularly use the bus service and who all have business that day on the Right Bank (Sartre 1976: 266). But compared to people gathered together for some collective purpose like a street festival or popular uprising, these bus-stop queuers produce only a ‘plurality of isolations’ (1976: 256). The bus passenger does not know how many people are going to be at the stop when he (sic) arrives or how full the next bus will be, and so is encouraged to see his fellow queuers as competitors for a potentially scarce resource. He takes a ticket from a machine by the stop, which indicates the order of his arrival and assigns him an order of priority when the bus arrives. By accepting this system, he acknowledges that his identity is interchangeable with that of the other passengers, a ‘being-outside-himself as a reality shared by several people’ which assigns him a place in a ‘prefabricated seriality’ (1976: 265). What seems clear from this passage is that Sartre is not very interested in the actual experience of waiting for a bus. Indeed, the passage is typical of the slightly begrudging, tangential way in which the quotidian has emerged as a subject of intellectual inquiry over the last century. Sartre uses the bus queue as an easily understood example, raw material for a thought experiment which allows him to move on to weightier matters of politics and philosophy. He sees it as an abstraction of the laws of political economy, based on the competitive quest for a limited resource – in this case, seats on the awaited bus. The actual queue itself is devoid of any wider meaning: ‘This unity is not symbolic … it has nothing to symbolise; it is what unites everything’ (1976: 264). The example only works because of the nature of the queue that Sartre describes. This orderly cohort of people taking tickets from a machine would certainly seem very strange to a contemporary British bus queuer. The ability to queue patiently is often seen as part of the British, or more especially English, national character. The Hungarian humorist George Mikes argued in How to be an Alien (1946) that ‘an Englishman, even if he is alone, forms an orderly queue of one’. For Mikes, uncomplaining queuing was ‘the national passion of an otherwise dispassionate race’ (1958: 48) and was symptomatic of other characteristics of Englishness: politeness to strangers, respect for order and deferral to absent authority. Writing in the early 1990s, though, Patrick Wright noted the more elaborate protocol of the London bus queue. 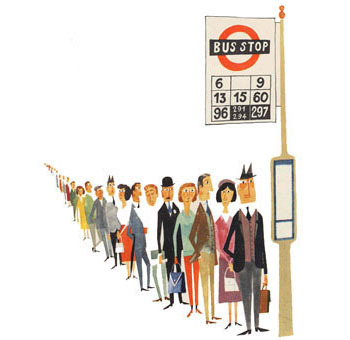 While conservative commentators were lamenting the decline of the well-ordered bus queue as symbolic of national decline and social anarchy, Wright suggested that the reality was more complex. The West End was indeed a ‘sordid scrum’, in which unprincipled natives pushed past tourists with impunity. But in quieter, residential areas, aggression and cheek did not always win out, as ‘each time a bus pulls up the crowd negotiates a messy but still intricately structured settlement between the ideal of the orderly queue and the chaotic stampede’ (Wright 1991: 125). Wright’s argument about the disintegration of the queue into less obvious, fragmented forms of social behaviour proved to be prescient. In 1994, a London Passenger Transport bylaw introduced in 1938, which made it illegal to stand more than two abreast at a bus stop, was repealed because it was no longer seen as workable (Jones 1994). In the centre of London, since 2003, passengers have had to pre-purchase their tickets from kerbside machines before boarding the bus, but this does not assign them any order of precedence in a queue. One problem with the modern bus queue is that it lacks what Barry Schwartz calls the ‘ecological supports’ of waiting, such as ‘queue this side’ signs or queuing channels created by cords and metal poles (1975: 99). These supports are increasingly common in commercial environments like supermarkets, banks and cinemas, where they are often supplemented by buzzers, digital displays and recorded voices saying ‘cashier number 5 please’. Bus queuers, though, are left to improvise their own waiting arrangements. On my own bus route, I have seen this lead to near-fistfights, as hordes of passengers clamber on to already packed buses in no particular order, and drivers with half-full buses speed past stops teeming with angry commuters, because they know they will have to let everyone board or no one at all. The bus queue is a reminder that even the most mundane routines incorporate complex spatial politics and cultural meanings. Waiting for the bus may be a well-known British tradition, but it is about as unglamorous an experience as you can get. It is not just that the unreliability and bunching up of buses makes passengers feel that they do not have ownership or control over their own lives (hence the familiar complaint: ‘You wait for ages and then three come at once’). It is that the second-rate service confirms their status as second-rate citizens. Buses are the most widely used form of public transport in Britain, and account for more than twice the number of journeys taken by rail ([Social Trends] 2004: 188). But they have low cultural status, because they are disproportionately used by (and, just as importantly, are associated with) women, children, students, the elderly and the poor. Although 86% of British households are within six minutes walk of a bus stop, a recent Social Attitudes Survey found that nearly two-thirds of people agreed with the statement: ‘I would only travel somewhere by bus if I had no other way of getting there’ ([Department for Transport] 2004: 42; [Social Trends] 2004: 189). It is hard to stand at a bus stop, as the single-occupant cars stream by, without feeling somehow denied full membership of society. Insofar as it forms part of cultural representation at all, the bus is the vehicle that cannot keep up with the pace of modernity, that ‘splutters along behind, picking up all those people who will never quite make it into either “History” or “Tomorrow”’ (Bonnett 2000: 27). Just before beginning this book, I read a newspaper report about Britain’s first queuing agency, Q4U, which aims to relieve Londoners of the hassle of queuing. For £20 an hour, the report said, its employees would line up for anything from passports to theatre tickets. Q4U recruits its workers from the ranks of the long-term unemployed who, according to a company spokesman, are used to queuing: ‘It’s a job that doesn’t require a lot of skill or experience. All you need is plenty of patience’ (Eden 2001). I have seen no evidence of Q4U since then; it may have overestimated the demand for queuing services. In fact, a queuing agency has a fairly obvious problem. The economics and practicalities of the more tiresome forms of waiting, such as standing at bus stops, do not support a market for surrogate waiters. In these contexts, it is difficult to separate the experience of waiting from its surrounding cultural practices and meanings. In his classic study of queues, Schwartz argues that the experience of waiting, and our attitudes towards it, embody social differences (1975: 22). For the poorest members of society, waiting is simply a daily experience as they queue for public transport, state benefits and doctor’s appointments. For the more affluent, waiting is less time-consuming and may be expected to come with compensatory props such as comfy chairs, bottomless coffee pots and reading matter. The changing fortunes of the British bus over the last two decades offer a case study in this differentiated experience of waiting. Under the 1985 Transport Act, the Thatcher government disbanded the National Bus Company and deregulated all local bus services outside London. To the act’s supporters, it replaced inefficient local authority monopolies with healthy competition and consumer choice. To its detractors, it carved up the bus services into a morass of holding companies and private firms, with no integration of timetables or ticketing, less provision for unprofitable routes and nobody to blame when the bus did not show up. The view that deregulation confirmed the social marginalization of bus users was reinforced by a remark attributed, perhaps apocryphally, to Thatcher: ‘If a man finds himself a passenger on a bus having attained the age of twenty-six, he can account himself a failure in life’ (Grayling 1999: 19). When the Labour government came to power in 1997, it combined a new concern with the delivery of public services with an unwillingness to alter the economic and political landscape created by Thatcherism. As urban traffic congestion became a significant electoral issue, the Department for Transport published From Workhorse to Thoroughbred: A Better Role for Bus Travel, which set a target to increase bus use by 10% by 2010. The government aimed to achieve this not through re-regulating the buses but through a ‘Quality Partnership Approach’ in which local authorities would work more closely with private companies to improve services ([Department for Transport] 1998: 2). It is a classic New Labour strategy: policy-making is not about weighing up competing priorities, but about public and private agencies working together to achieve pre-agreed ends, with ‘everybody concentrating on what they do best’ (1998: 2). While the local authorities could integrate and coordinate services, the private operators could show ‘responsiveness to the customer’, ‘flexibility’ and ‘incentive to innovate’ (1998: 22). The current status of bus travel suggests the limitations of such a policy. Labour is on course to achieve its target of increased bus use, but only because it has risen dramatically in London, which accounts for about a third of all bus journeys in Britain ([Social Trends] 2004: 188). The buses were never deregulated in the capital, and the Greater London Authority formed in 2000 has exercised considerable central control. Almost everywhere else in the country, bus use is static or falling ([Office for National Statistics] 2003). It would be difficult to find a piece of modern architecture that inspires less interest than the bus shelter. It is an omnipresent object of everyday life which, when it registers in the public consciousness, is usually only associated with graffiti and vandalism. But there has been an unnoticed bus-shelter revolution in recent years. Many of the world’s shelters are now supplied by just two companies, both of which deal with outdoor advertising: Clear Channel Adshel and JCDecaux. These firms have built themselves into global brands since the 1990s, winning thousands of street furniture contracts throughout the world. As more and more local authorities contract out their public services to private companies, bus-shelter design has become an adjunct of the advertising industry. In Britain, Adshel is the market leader with an 80 per cent market share. It supplies and maintains its shelters free of charge, in return for the right to display advertising on some of them in backlit ‘6-sheet’ panels. Bus shelters will normally have just one advertising panel, but on prime sites in city centres they can have two or more, with rotating displays to maximize revenue. Adshel bus shelters are architect-designed, with trendy names for particular ranges: Metro, Classic, Skylight, Avenue. The company takes pride in the high quality of its shelters, which use graffiti- and etch-resistant materials, reinforced glass, bright colours and courtesy lights. A 2003 government white paper on combating anti-social behaviour commended Adshel for its success in cleaning bus shelters and removing graffiti, and working with the police to reduce vandalism ([Home Office] 2003: 70). It is a public-private partnership which seems to benefit all parties: Adshel gets free advertising, while the local authority gets free shelters, and does not have to spend thousands of pounds cleaning them, removing graffiti and sweeping up broken glass. It is, according to Adshel’s managing director, ‘a win-win business model for all concerned’ (France 2002: 8). But the sponsored bus shelter is also a case study in the colonization of urban landscapes by the market. Adshel has been supplying advertising in bus shelters since the 1970s, but it really began to boom because of two key developments in the late 1980s. The first was the installation of illuminated posters called ‘Adshel Superlites’. The second was the advent of a data system called OSCAR (Outdoor Site Classification and Audience Research), providing information on vehicle and pedestrian traffic near poster sites (Sutherland 1989). These innovations allowed advertisers to direct their campaigns beyond the unglamorous target market of the habitual bus-user. The ads are now also aimed at passing pedestrians and motorists, which is why they are big on visual impact and short on copy. The economies of scale created by multinational advertising companies, combined with the need for these companies to sell attractive packages to city councils, have produced an interesting tension between global standardization and local difference. In Liverpool, the city where I work, there is a surprising variety of bus shelters built around the standard steel frame (see figure 1.1). The contracts between the advertising companies and local authorities stipulate that the former will provide a certain number of shelters if they can advertise in an agreed proportion of them. The ‘de luxe’ shelters, with barrelled glass roofs, glass walls on all sides and dot-matrix displays with Real-Time Passenger Information Technology letting passengers know when the next bus is due, do not have advertising. The shelters with adverts, which tend to be in the prime city-centre sites or the main routes into town, are much more rudimentary. They have a cantilevered roof or windbreak ends extending only part of their width, so that the ads can be seen by everyone. The outdoor advertising companies have understandably expended their energies not on prioritizing warmth and comfort for bus-stop waiters, but on developing new forms of advertising, such as talking adverts, triggered by motion sensors, and ‘dynamic image’ posters in which, for example, steam appears to rise from cups of Heinz soup ([Clear Channel Adshel] 2004). In several British cities, we can see the logical culmination of this commodification of public space: redundant bus shelters built solely for advertising, where no buses stop and no bus users wait – unless, of course, they have been cruelly misinformed (Mintowt-Czyz 2000: 22). Several recent news stories have suggested that innovative technologies will improve the experience of waiting for a bus. Twelve-foot poles with propellers on top will use wind power to generate electricity to heat the seats in bus shelters (BBC News, 16 January 2002). Buses4U, a pilot scheme funded by the Department for Transport, will allow passengers to book a bus by text message up to 30 minutes in advance, allowing them to wait in a nearby pub rather than the shelter (Monro 2004). Touch-screen bus shelters using plasma technology will be able to show timetables, maps and weather forecasts (Pearson 2002). Networked computers placed in shelters will allow bus passengers to access local news, council websites and e-mail accounts ([Daily Mirror] 1999). The important point about these stories is not that they are untrue – in two cases they refer to schemes already in operation – but that such innovations are applied unevenly. For most people waiting in bus shelters, they remain in the realm of science fiction. The bus shelter is a kind of prism through which we can read the uneven modernization of everyday life and the changing priorities of society. It is no longer primarily a functional piece of architecture, still less a civic space; it is a marketing opportunity. Bus shelters may be more interesting to look at than they used to be, but waiting for a bus remains an unpredictable, low-status activity. Doreen Massey suggests that the practice of standing at a bus stop counters the more excitable visions of contemporaneity in cultural theory, which emphasize its restless mobility and pervasive mediatization. ‘Much of life for many people, even in the heart of the first world’, she argues, ‘still consists of waiting in a bus-shelter with your shopping for a bus that never comes’ (Massey 1992: 8).